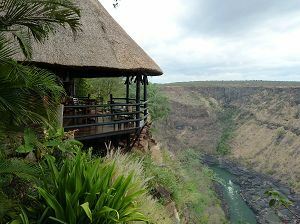 A special Lodge uniquely situated high above the Zambezi River Gorge just downstream of the Victoria Falls, with dramatic views that are sure to take your breath away! You can enjoy one of six single or four double-story luxury chalets within the gardens which includes a swimming pool. The chalets are set up into two double and 8 twin rooms with ceiling fans, stocked with bar fridge, shower, bath, flush toilet and hot and cold running water. Every chalet has its own private veranda. The main building comprises a lounge, dining room and bar area. 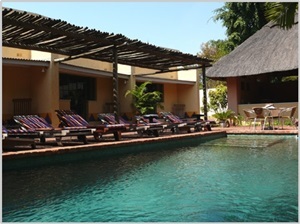 Amadeus Garden is a privately owned guesthouse with B&B style accommodation in eleven en-suite rooms. 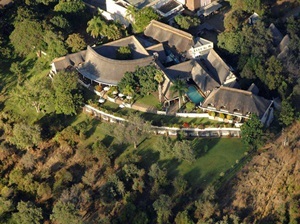 The lodge is set in a spacious 3,000 m² green garden with swimming pool and in walking distance to the Victoria Falls. Amadeus offers accommodation in eleven rooms 9 twin bedded and 2 double bedded rooms with solar heated en-suite hot and cold shower, WC, windows fitted with fly-screens, naturally ventilated by ceiling fans and an electronic safe. Cool off in a crystal clear swimming pool, enjoy a snack and sip a drink; share the stories of your African holiday with other travelers from all over the world. 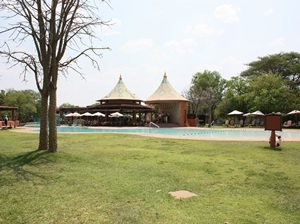 The Hotel is ideally situated being the closest to the mighty Victoria Falls as well as the town centre. The National Park borders the front of the property and wild animals often graze on the hotel lawns, with the spray of the falls in the background. Warthogs are common visitors and their comical appearance and behaviours are sure to delight and entertain you during your stay. The two onsite restaurants, The Palm Restaurant and Kubika, will satisfy all your culinary cravings with glorious buffet breakfasts and a la carte menus offering Moroccan themed dishes.Ilala Lodge Hotel offers 34 rooms in total, 30 Standard Twin Rooms - each with two 3/4 beds in each, 2 Standard Double Rooms - each with one Kingsize bed in each, 2 Deluxe Suite Rooms - both situated on the upper level each with 1 Kingsize bed and 1 extra 3/4 bed for either an extra adult or a child. All rooms have en suite bathroom with separate shower, air conditioning units, overhead fans, satellite TV, tea & coffee facilities, hair dryers and a small safe. The Zambezi Sun is a 3-star Victoria Falls hotel located in Livingstone and offers a choice of 212 en-suite rooms where you can relax in a cool, uncomplicated setting. Each room has a view of either the lush African bush or the large landscaped swimming pool that lies at the heart of the hotel. The Zambezi Sun is known and celebrated for its world-class service offerings, always ensuring guests are treated to the best Zambia has in everything, from activities to dining, conferencing and child care. The Zambesi Sun offers 3 restaurants and a pool side bar & grill so that it is granted that you will find something to tickle your taste buds. The Poolside Grill and Pool Bar offers light lunches and drinks. A live band at the pool bar will entertain you long into the night. The Royal Livingstone offers a total of 173 en-suite guestrooms offering splendid accommodation in 17 riverbank residences. The hotel and it's staff is living Victorian elegance and splendour. The luxurious Presidential Suite has housed royalty, heads of state and celebrities. The rooms are inspired by a combination of Victorian elegance infused with Africa’s tribal warmth. Each room has its own private terrace overlooking the Zambezi River. As one of the early settlers in Livingstone wrote in his journal, "At 6 o'clock the sundowner ritual begins…This is a time-honoured social routine…Groups of up to a couple of a dozen would visit each other for a drink, to gossip and exchange news." The two sundecks overlooking the Zambezi River at The Royal Livingstone Hotel make the perfect setting in which to honour this fine tradition. 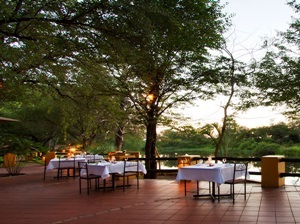 The Royal Livingstone Dining Room will feed your soul and your stomach. Indoor tables offer a more intimate dining experience, while those outside bring to life the sights and sounds of an African day. The Lounge and Travelers’ Bar caters for high teas and drinks. Ideally located just 4km from the Victoria Falls and just outside of Livingstone, Maramba River Lodge provides a most attractive all-year-round accommodation base in a shaded woodland setting. The Lodge is situated on a bluff overlooking the Maramba River and is often visited by the resident wildlife with elephant wandering through the grounds at certain times of the year. The six luxury safari tents provide all the comforts of a lodge without sacrificing the pleasures of a camping experience. The en-suite bathroom is tiled throughout with a shower open to the African sky. Tents are available with twin beds, doubles and singles. 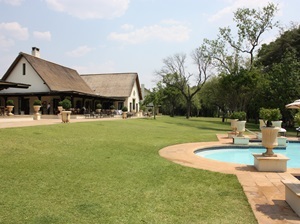 Maramba’s private chalets are spacious and airy and nestle under mopane and mahogany trees. All our rustic, thatched chalets have en-suite tiled bathrooms, mosquito proofing with treated nets, ceiling fans, internal safe, and views over the Maramba River or floodlit waterhole. Chalets are available in twins, doubles and family units that sleep 4. The Safari Tents offer en-suite bathrooms and mosquito nets all under thatch. These small yet well appointed tents offer the perfect compromise between budget and room facilities. Twin bed en-suite bathroom. 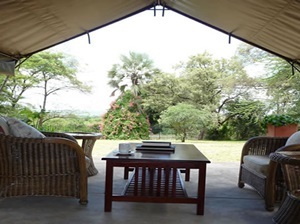 The Dome tent area named ‘The River Camp’ is set on the bank of the Maramba River. Five 3 x3 meter walk in tents fitted with two full size single beds, bedside lamp and a lockable drawer. They have a dedicated ablution block with covered sitting area with views over the Maramba River.